We at IAHPC know that advocating for, and implementing, palliative care programs is challenging, uphill work. This is why we instituted this section, to celebrate the successes and share the challenges of your local, regional, and national palliative care programs. Send us your write-ups (no more than 500 words), with photos or short videos, here for consideration. Dr. D.K.D. 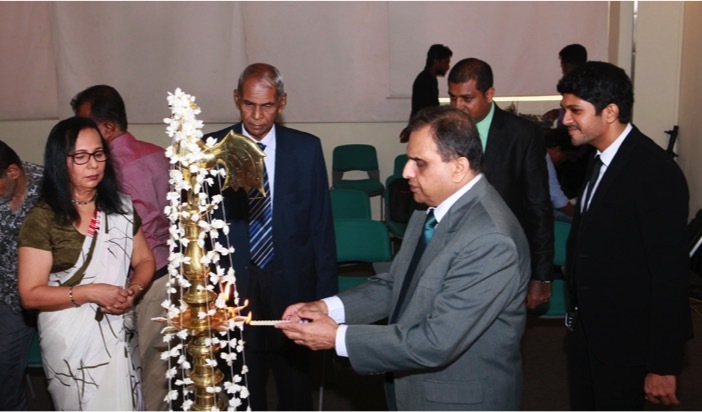 Mathew, President of the Palliative Care Association of Sri Lanka, lights the oil lamp of learning at the beginning of the Association’s annual seminar. He is joined by Secretary of the Association Dr. Pushpa Weerasinghe, to his left, and guest speaker and former Ambassador Mr. Thosapala Hewage, as other attendees look on. About 200 people — doctors, nurses, paramedics, medical students, older persons, and persons with a disability — attended a half-day organized by the Palliative Care Association of Sri Lanka to coincide with World Hospice and Palliative Care Day on 13 October 2018. The Association has organized a seminar every World Hospice and Palliative Care Day since its inception in Sri Lanka in April 2015. There are currently about 150 active members, including associates, members, lifetime members, and corporate members. Guest speaker Mr. Thosapal Hewage, Sri Lanka’s former Ambassador to Nepal, recounted the harrowing experience of his own liver disease as well as his wife’s medically necessary amputation above the knee, due to cancer. As Buddhists, he credited their inner strength, and acceptance of their own mortality, to the Dharma Deshana (Buddhist TV) they listened to and Dhamma books they read. ‘Sri Lanka has a population of 22 million and there are approximately 112,500 deaths a year. The total number needing palliative care in the country can be estimated to be 60% of all deaths, or 68,000 people a year. With the rapidly ageing population, the majority of future patients who will need palliative care will come from the elderly terminally ill.
‘The Palliative Care Association of Sri Lanka, a national umbrella organization for palliative care in the country, has been formed recently. Formal palliative care services are not available in the country except for a few hospices that offer limited services to patients with advanced cancer. ‘As there is no government-approved national policy, at present there is no holistic approach or strategic plan to implement palliative care services. It is time for the government to formulate a national palliative care policy with strategies to implement the policy. Experience shows that most terminally ill patients prefer to die at home and that palliative care through home care is essential. It is therefore necessary to formulate a policy for home care services too as part of primary health care for the incurably and terminally ill patients. ‘There is an urgent need for health care professionals and community health workers to acquire and develop the knowledge, attitudes, and skills necessary to provide services for the thousands of patients in need of care as part of primary health care. Therefore, training and skill development of such category of officers is essential.